Effective performance management is at your fingertips with Performance Scoring. Get started today and transform your company into a high performance company. Upon completion of the onboarding questionnaire, a Performance Scoring Expert will contact you within the business day to complete creation of your organization’s performance management application. 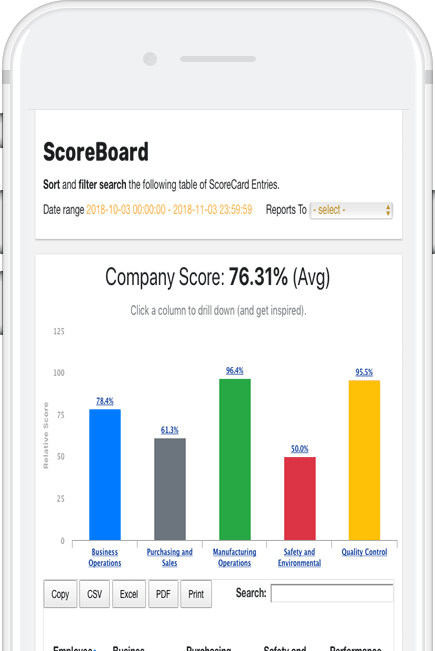 By filling out a quick, one-page questionnaire after checkout, you are seeding the coming development of your organization’s performance management application. Focusing on your company’s structure and a few key factors, Performance Scoring will spin up your app in one business day. A quick ten minute onboarding meeting to discuss your organization’s performance management application will ensure that your application is designed to compliment; reflecting your company’s structure and performance needs. After a short introductory training video, accompanying each new-user registration email, your staff will be using Performance Scoring within minutes. In addition, there are many in-depth performance management training videos and support articles, as well as scheduled virtual training meetings, and webinars. Performance Scoring measures only the objective data that you know leads to success. Identify the areas of high performance and the areas where coaching and improvements are needed company-wide, with departments & teams, and individual employees. Performance Scoring will make peer-to-peer feedback and employee engagement a key strength to your company. With this strength, experience greater employee development, lower attrition, and the ability to promote from within.